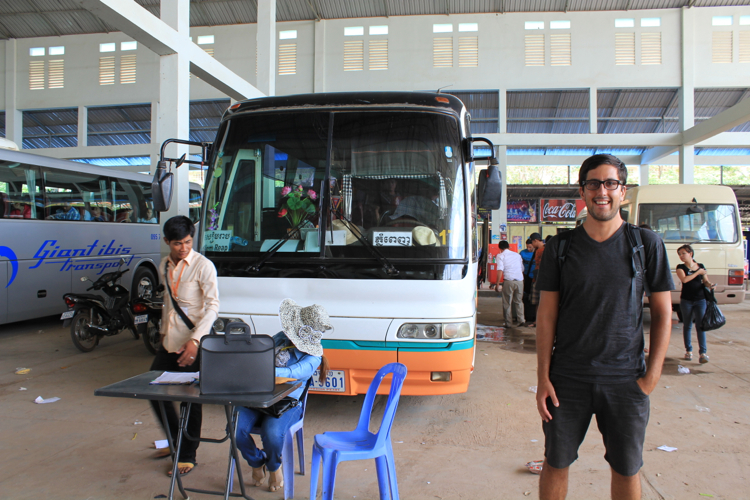 What should’ve been an uneventful bus ride from Siem Reap to Phnom Penh, Cambodia turned out to be a tad more frustrating than expected. We might come off as ignorant and spoiled tourists with a sense of entitlement… but I shall post my rant about our experience nonetheless. I suppose we should’ve went to a travel agency instead, or did more research on busses and went directly to the bus company. We had simply picked our route and preferred time from a whiteboard at our guesthouse, assuming they’re all the same. 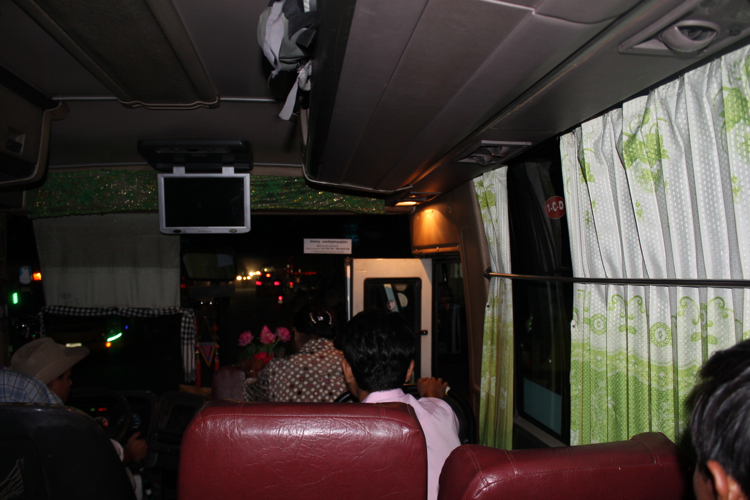 What made the bus “VIP” was that it was air-conditioned, had a toilet onboard (which I did my best to avoid), and presumably went directly to Phnom Penh. Maybe we should’ve clarified that last point before purchasing the bus tickets, but we didn’t even know to ask at the time. Our bus was scheduled to leave at 12:30 pm from the bus station. We were told to wait in the lobby at 11:30 am for a shuttle to pick us up and take us to the station, so that’s pretty nice and convenient. The bus ticket stated that we should arrive 20 minutes before departure time. Perhaps we should’ve known that delays were expected, because we were concerned when the shuttle was still not at our guesthouse by 12:10 pm. Eventually the shuttle showed up at 12:15 pm; we got to the bus terminal at 12:30 pm, and the bus departed at 12:50 pm. And of course there were touts at the bus terminal who follow you around trying to sell you snacks until you run away and hide from them on the bus. One guy kept holding small bags of fruit right in front of Adam’s face despite his repeated response of “no thank you”. At one point it almost seemed like the guy was doing this for fun. I would like to note that we were not frustrated at this point and simply found it amusing. When we left, the bus was probably 40% full. 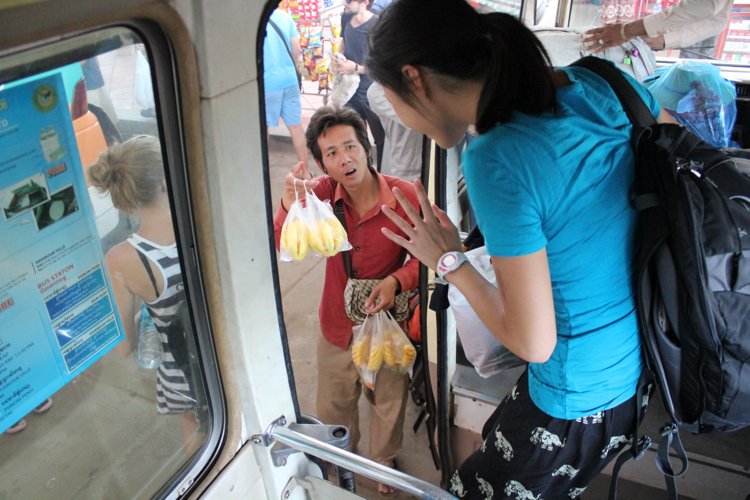 Two hours into the journey, we stopped alongside a road with several street vendors. A sign was put up at the front of the bus indicating “20 minute refreshment break”. The A/C was turned off so you were encouraged to get off the bus. It was here that several Khmers got onto the bus and we saw money change hands. 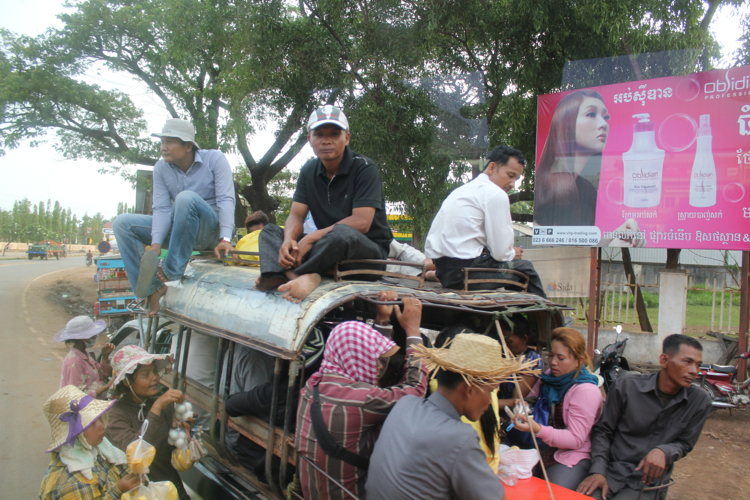 From that point on, the bus continued to stop and pick up more Khmers regularly for the rest of the trip. 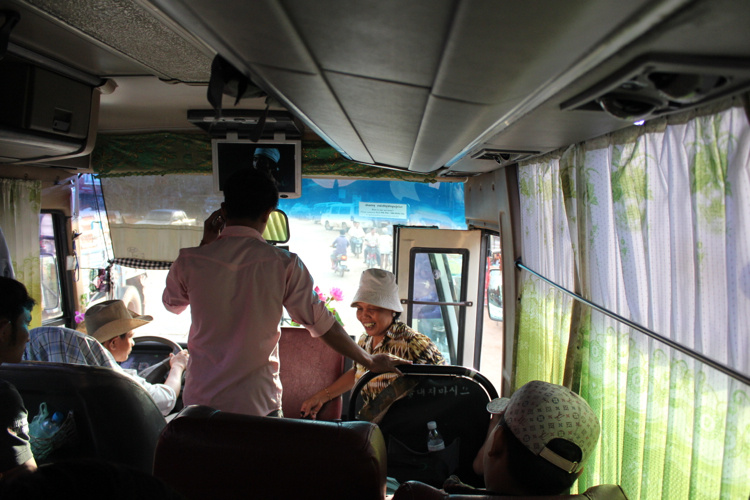 As we made more stops, and more Khmers got on, we could see from the window that the assistant driver (not sure what his official title is) would hop off and hand a referrer on the street a small commission. We could also see the assistant driver collecting money from the hop-ons, and it looked like a fare of about 2,000 Riels ($0.50 USD). I suppose the Khmers that came onto the bus were considered the wealthier ones, because we saw the alternate method of travel. 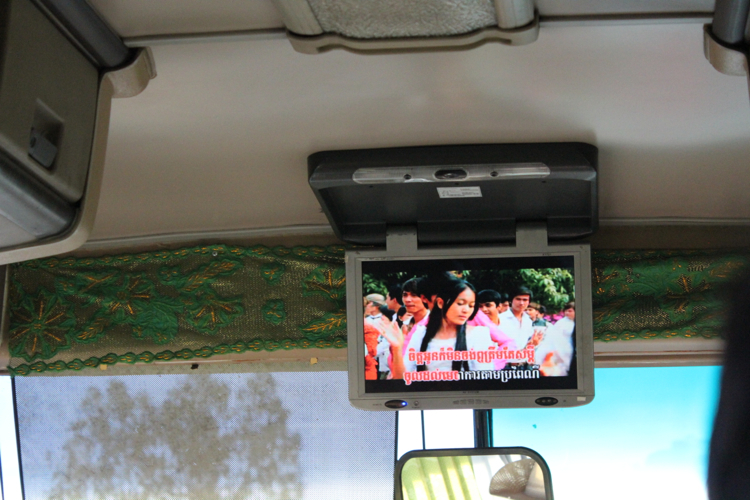 Another hour and a half into the trip, Cambodian music videos and old Chinese movies with Cambodian subtitles came on at the front of the bus. I zoned it out while reading Harry Potter (yes I’m behind). Adam chose to listen to music while trying to catch up on blog posts. The lady in the seat on the other side of the aisle didn’t seem to enjoy the movie however, because she started to play Khmer music loudly from her cell phone. I could see other tourists getting a little frustrated as they were trying to sleep. The assistant driver did eventually come over and ask the lady to turn off the music from her cell phone. An observation Adam made was that every time there was a road sign pointing to Phnom Penh, we would go in the opposite direction. This was likely so that the driver could pick up more people from neighbouring towns. We finally arrived at our destination at 6:40 pm, but this was not before making several stops in various places so that individual Khmers could get off to where they needed to go. 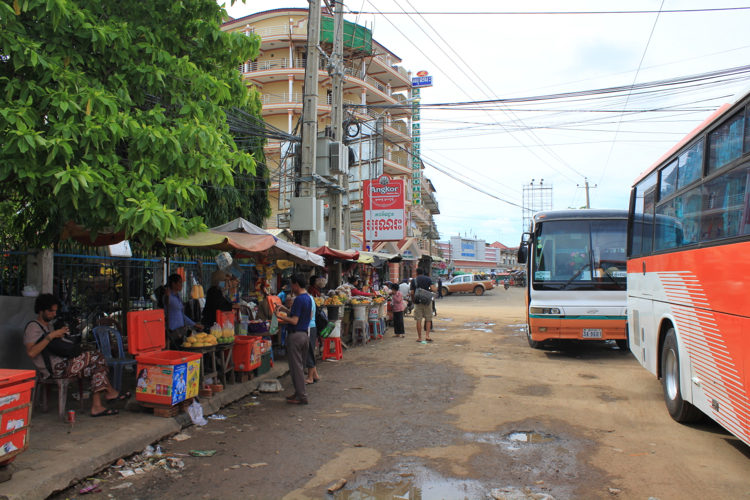 When we booked the bus tickets, we were told that the bus would drop us off at the Night Market, but as with our Bangkok to Siem Reap trip, we were dropped off in front of a travel agency. The tuk tuk drivers waiting for our arrival here were much more aggressive than the ones in Siem Reap. We paid $8 USD for our trip, while Khmers got on for $0.50 USD or less. The trip could’ve been done in much less time if we didn’t keep stopping and making detours to pick up and drop off more passengers. The bus dropped off individuals to where they needed to go, while all the tourists got dropped off in front of a travel agency. We would’ve liked that kind of door to door service. We were dropped off right in the middle of a frenzy of aggressive tuk tuk touts, left to fend for ourselves. Tuk tuk drivers were offering us a ride to our guesthouse for $1 USD, which was perfectly reasonable. However on principle, we had had enough of being taken advantage of because we were foreigners, plus our guesthouse was less than 1 km away, so we opted to walk. Back to the bus topic – I initially assumed it was the drivers who were pocketing the extra fare, at the expense of inconveniencing a bunch of “rich” tourists. But maybe the bus companies are in on it too. I would love to hear some insight if anybody knows exactly how the “system” works. Our frustration stems from the fact that we were not prepared for such an experience. We had our Western expectation of a direct bus to our destination. We did not appreciate the surprise of seeing hop-ons who pay a significantly lower price, and we did not appreciate all the detours that were made. Maybe we’re being completely unreasonable, and that’s simply the way things work in Cambodia, or Asia, and we just have to accept it. $8 USD for a bus ride covering 316 km is pretty cheap. The cheapest Greyhound bus from Toronto to London, a distance of 191 km, is $18 CAD. So as the Real Frugal Traveller says – this is a lesson in you-get-what-you-pay-for? We will chalk this one up to inexperience and lack of research, because we would gladly pay more for a direct bus. By the way, the bus company we ended up with was Sohka Komartep, so at least that’s one company you’ll know to avoid if you are looking for a proper direct bus. 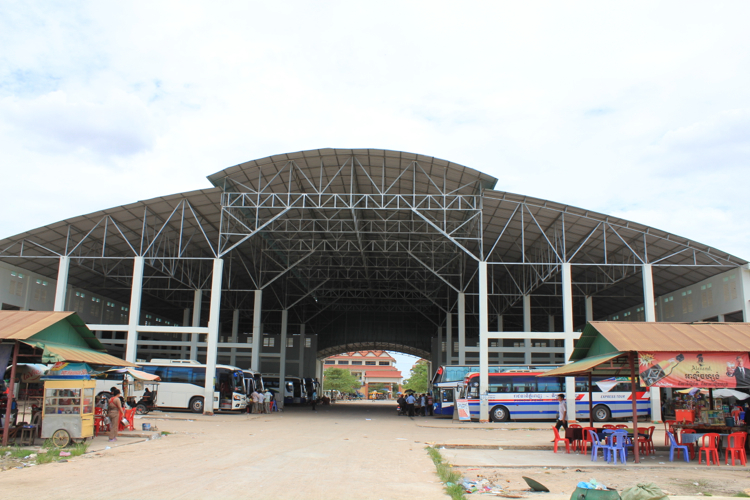 Lastly, after doing a bit more research, we’ve come to learn that Mekong Express is one of the more reputable and reliable bus companies in Cambodia. 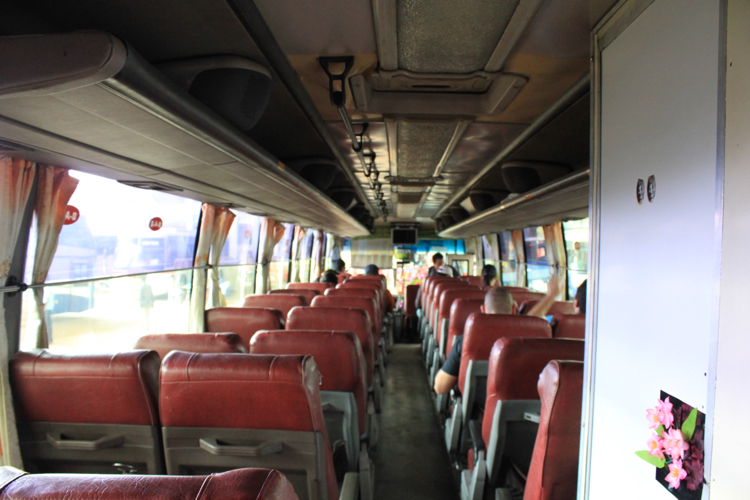 I can’t be sure if they don’t also make stops along the way for more passengers on their Siem Reap to Phnom Penh route, but we took this bus from Phnom Penh to Ho Chi Minh City and it was great! Uff, what an experience! I’d be mad, too, especially after seeing how other passengers just got on and off for a fraction of the stated price. Another informative and helpful post, thanks. We will be doing this trip and on to Ho Chi Minh City soon. I was already thinking of using Mekong Express so its good to know they were a reliable choice for you on the Phnom Penh to Ho Chi Minh route. The service on Mekong Express was fantastic! The attendants were very organized, mild-mannered and helpful. very informative. 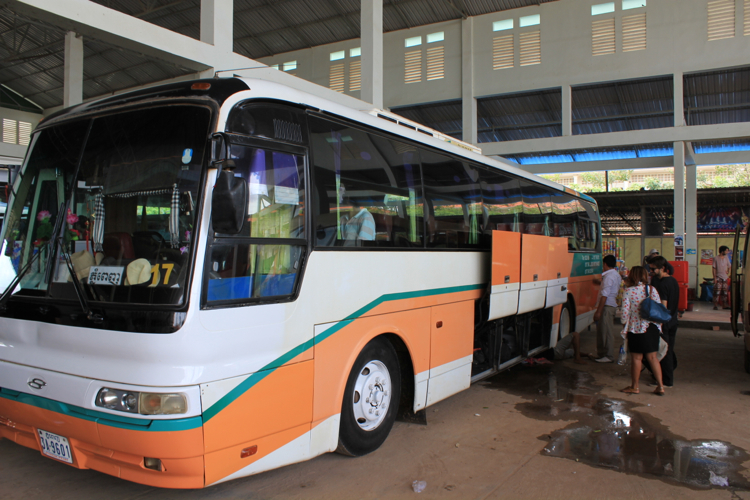 next week, im going to siem reap & phnom penh but prefer midnight bus. do you have any recommendation for midnight bus? Sorry but I’m not familiar with the night busses 😦 The Mekong Express that I’ve recommended doesn’t seem to do night runs between Siem Reap and Phnom Penh. Have you guys seen episodes of the National Geographic show “Scam City”? It’s available online. It’s fascinating the intricate network of corruption and deceit in the tourist industry. There’s an episode in Bangkok that you guys can probably relate to. I have traveled a lot in Cambodia, and yes: this is just how it is. It’s frustrating the first time, perhaps, but it becomes just another of the adventures you come to expect in Southeast Asia. I always figure how else are the locals going to travel longer distances in the dust and the heat, and laden, sometimes, with goods? 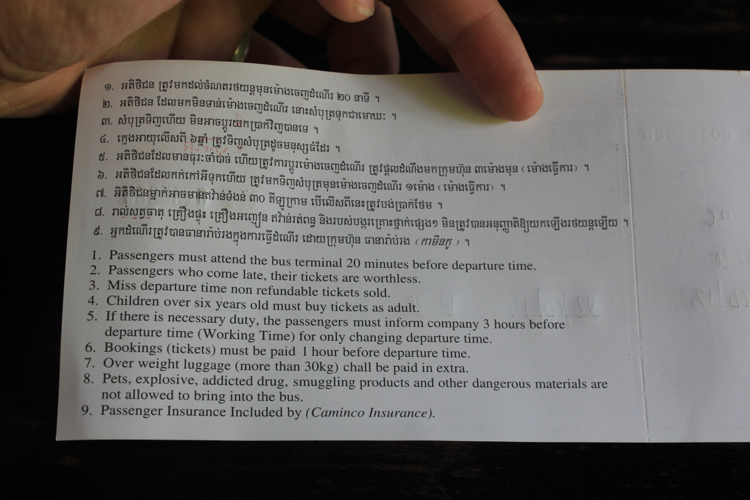 And $8 is a fortune to the rural Khmer, and a pittance to me, so I see the difference in fare as – well, fair. 🙂 The VIP mini-buses, now, can be much worse, as they are allowed to load more people than seats. 13 people in a 9-seater? No fun, and never again. was not so lucky.. They were told to leave the next day as the bus company office they bought the ticket from was closed. Oh my goodness what a disaster! I would’ve been terrified if I were you! Who knows where they might take you on a tuk tuk and a motorbike. In comparison, we can’t complain at all about our bus ride. months single visa and again 59 USD for three months multiple visa. 1) I never use free pick-up services as they are generally unreliable. Also sometimes you might the first pick-up customer and the pick-up van might take you for detour to pick other customers wasting a lot of time of yours. 2) Road situation has deterioted a lot and now only the mini-buses can make this journey in 6-6.5 hours, big buses takes around 7-7.5 hours even with limited 1-2 stops. Some buses can take upto 9 hours. 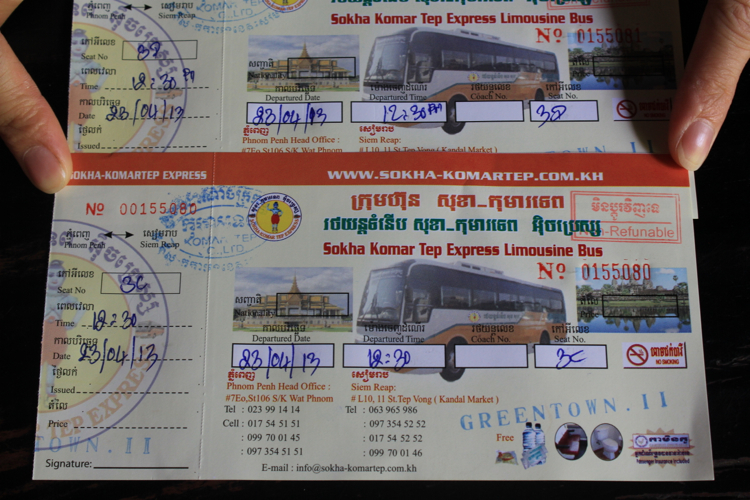 3) Although the practice of picking passengers along the way is very common as the income is generally unreported and goes directly to the bus staff, Sokha Komartep doesn’t have a good reputation. More reputed companies like Mekong, Giant IBIS, Golden Bayon, Orient, VGS and Citylink tend not to stop during the trip but again it is not guranteed. 4) Generally avoid buses with toilets as they can make the bus stink. Most of the buses make atleast 1-2 toilet/snacks stops. Great post and informative. 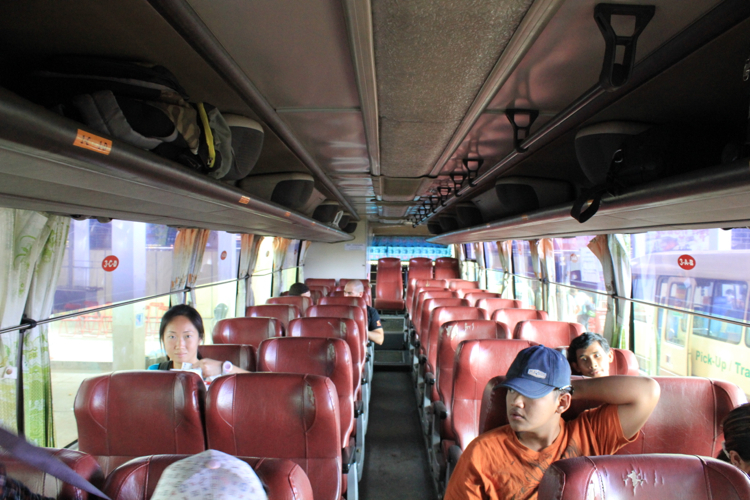 We took the sleeper bus to Phnom Penh and changed bus to Siem Reap. Thanks!